Definition at line 14 of file io.h. Definition at line 53 of file io.h. Definition at line 21 of file io.h. Definition at line 22 of file io.h. Definition at line 20 of file io.h. Definition at line 19 of file io.h. Definition at line 125 of file io.h. Definition at line 132 of file io.h. Definition at line 93 of file io.h. Definition at line 87 of file io.h. Definition at line 92 of file io.h. Definition at line 108 of file io.h. Definition at line 151 of file io.h. Definition at line 205 of file io.h. Definition at line 178 of file io.h. Definition at line 160 of file io.h. Definition at line 214 of file io.h. Definition at line 187 of file io.h. Definition at line 142 of file io.h. Definition at line 196 of file io.h. Definition at line 169 of file io.h. Definition at line 110 of file io.h. Definition at line 225 of file io.h. Definition at line 238 of file io.h. Definition at line 47 of file io.h. Definition at line 116 of file io.h. Definition at line 74 of file io.h. Definition at line 78 of file io.h. Definition at line 70 of file io.h. Definition at line 66 of file io.h. Definition at line 82 of file io.h. Definition at line 486 of file io.h. Definition at line 265 of file io.h. Definition at line 246 of file io.h. Definition at line 255 of file io.h. Definition at line 532 of file io.h. Definition at line 1146 of file irp.c. Definition at line 2510 of file file.c. 2532 /* If not define, we want to reset filter context. 2533 * We will remove value (provided by the caller) and set NULL instead. 2534 * This will only success if caller provides correct previous value. 2537 * Otherwise, it will contain a non-zero value. Referenced by FsRtlInsertPerFileObjectContext(), and FsRtlPTeardownPerFileObjectContexts(). Definition at line 26 of file util.c. Definition at line 2495 of file file.c. Referenced by FsRtlInsertPerFileObjectContext(), FsRtlLookupPerFileObjectContext(), FsRtlPTeardownPerFileObjectContexts(), and FsRtlRemovePerFileObjectContext(). Definition at line 1606 of file device.c. Referenced by FsRtlNotifyVolumeEvent(), IopNotifyPlugPlayNotification(), and NtSetVolumeInformationFile(). Definition at line 67 of file irp.c. Referenced by IopFinalizeAsynchronousIo(), IopPerformSynchronousRequest(), IopQueryDeviceInformation(), IoSetInformation(), NtQueryInformationFile(), and NtSetInformationFile(). Definition at line 2449 of file file.c. Referenced by IopResetDevice(), and IoReportDetectedDevice(). Definition at line 716 of file irp.c. Referenced by IoCancelFileOpen(), IopCloseFile(), and IopDeleteFile(). Definition at line 573 of file irp.c. Definition at line 1060 of file pnpres.c. Referenced by IopStartDevice(), and IoReportDetectedDevice(). Definition at line 81 of file volume.c. 95 Alertable = (OpenPacket->CreateOptions & FILE_SYNCHRONOUS_IO_ALERT) ? Definition at line 45 of file irp.c. 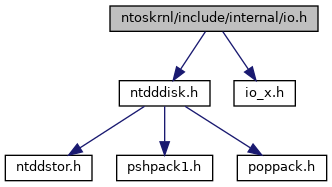 Referenced by IopDeviceFsIoControl(), IopGetSetSecurityObject(), IopQueryDeviceInformation(), IoSetInformation(), NtFlushBuffersFile(), NtLockFile(), NtNotifyChangeDirectoryFile(), NtQueryDirectoryFile(), NtQueryInformationFile(), NtQueryVolumeInformationFile(), NtReadFile(), NtSetInformationFile(), NtSetVolumeInformationFile(), NtUnlockFile(), and NtWriteFile(). Definition at line 2177 of file file.c. Referenced by IopCreateObjectTypes(), and IopDeleteFile(). Definition at line 238 of file irp.c. 329 * did return from a pending I/O Operation and is not synchronous. 390 * to make sure there's no APC fired. 408 * to make sure there's no APC fired. 487 * request was synchronous. 513 * that was opened this way. Signal its event. Referenced by IofCompleteRequest(), IopPerformSynchronousRequest(), NtQueryInformationFile(), and NtSetInformationFile(). Definition at line 42 of file arcname.c. 129 /* Don't quit here, even if everything went fine! 131 * devices with symlinks. 133 * even if it didn't find boot device. 134 * It won't reset boot device finding status as well. Referenced by IopInitializeBootDrivers(), IopInitializeBuiltinDriver(), IopLoadUnloadDriver(), and IoReportDetectedDevice(). Definition at line 1461 of file driver.c. 1526 * IoCreateDriver() was called to initialize a built-in driver. 1638 /* We're going to say if we don't have any DOs from DriverEntry, then we're not legacy. 1646 * Make sure the driver didn't set any dispatch entry point to NULL! 1648 * do not implement. Referenced by IoCreateDriver(), and IopInitializeDriverModule(). Referenced by IopInitializePlugPlayServices(), IopStoreSystemPartitionInformation(), and IoSetSystemPartition(). Definition at line 155 of file volume.c. Referenced by IoCreateDevice(), and IoVerifyVolume(). Definition at line 58 of file driver.c. 1453 * by a filesystem. Referenced by IopCreateObjectTypes(), and IopParseDevice(). Definition at line 100 of file iocomp.c. Definition at line 462 of file device.c. 473 * an unload, which is OK too). Referenced by IoCreateStreamFileObjectEx(), IoCreateStreamFileObjectLite(), IopCheckVpbMounted(), IopDeleteFile(), and IopParseDevice(). Definition at line 183 of file volume.c. Referenced by IopParseDevice(), and IoVerifyVolume(). Definition at line 1200 of file pnpres.c.